Create a dramatic impact in your property with the wide, uninterrupted glass area of upvc patio doors from A6 Windows purpose made for your property .With stainless Steel rollers and track gives smooth and durable operation making opening and closing effortless. Our patio doors have 6 high security hook bolts that lock into a one piece stainless steel locking keeps the locking handle features an anti-pick device for added security making double glazed sliding upvc doors from us strong and secure. 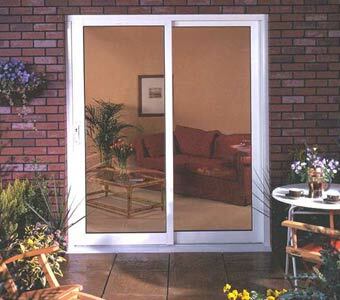 In addition the outer frame and opener are steel reinforced and an anti-slam and lift device is fitted as standard .Requiring very little maintenance these doors really do bring the garden into your property while increasing energy efficiency . Any company can provide you with cheap replacement upvc patio doors , Upvc Patio doors installed by us have the following features often not found on cheap upvc patio doors . We will be happy to provide an estimate for you to compare our prices and are sure you will be amazed at the cost and quality of our patio doors . 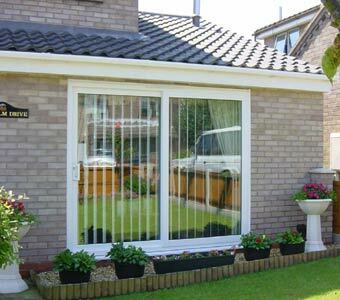 Due to that way these doors open taking up minimum space there are many areas of your property that you could install In-Line Patio Doors such as -porch , conservatory , dining areas . Available in 2, 3, or even four panel permutations to suit any property . Slider features 6 high security hook locks which anchor in stainless steel keeper plates.